George Herbert Walker Bush, the 41st president of the United States and the head of one of the most prominent political families in American history, arguably best known for assembling the multinational coalition that liberated Kuwait and launched a permanent US presence in the middle east, died Friday at the age of 94. Bush governed the nation from 1989 to 1993, making him the last president of the Cold War era. The former president died at 10:10pm (local time) on Friday. Funeral arrangements will be announced some time later, the spokesperson for the Bush family, Jim McGrath, said in a statement. His health deteriorated in recent years, as he suffered from lower-body Parkinson’s disease and was confined to a wheelchair. In April, Bush was discharged from a hospital after receiving treatment for low blood pressure. No cause of death was given. Instead the statement simply announced that “the entire Bush family is deeply grateful for 41’s life and love, for the compassion of those who have cared and prayed for Dad, and for the condolences of our friends and fellow citizens." On Saturday morning, president Trump - who had a rocky relationship with the Bush family - praised Bush for his “essential authenticity” and “disarming wit.” His “unflappable leadership” brought the US and the world “to a peaceful and victorious conclusion of the Cold War,” Trump said. In a follow up tweet on Saturday morning, Trump tweeted that "President George H.W. Bush led a long, successful and beautiful life. Whenever I was with him I saw his absolute joy for life and true pride in his family. His accomplishments were great from beginning to end. He was a truly wonderful man and will be missed by all!" Bush served for eight years as vice president to Ronald Reagan before winning the White House himself, beating Democratic opponent Michael Dukakis by a convincing margin in 1988. He thus became the first incumbent vice president since Martin Van Buren in 1836 to be elected to the nation’s highest office. According to The Hill, Bush showed "considerable deftness and prudence in foreign affairs, leading a broad international alliance to victory in the first Gulf War and helping to ensure order, rather than chaos, following the collapse of the Soviet Union." But he was undone by a recession, an infamous U-turn on a campaign pledge not to raise taxes and a more nebulous but important perception that he was not in touch with the challenges faced by the general public. Former President Clinton thwarted his bid for reelection in 1992, imbuing Bush with the scent of failure that clings to all one-term presidents. Bush joined the Navy at 18, becoming one of its youngest fighter pilots in World War II. During the war, he flew multiple combat missions and was shot down at one point. Upon his return home, the young man was awarded with a Distinguished Flying Cross. After the end of the war, Bush earned an economics degree from Yale and, declining to join his father’s business, built up his own career in the Texas oilfields. Bush first moved into the White House in 1981 at the height of the Cold War, serving as vice president under Ronald Reagan. After assuming the presidency in 1989, Bush, along with Soviet leader Mikhail Gorbachev, helped to end the dangerous confrontation between the two superpowers. In 1991, he led the nation during the Gulf War against Iraq after its leader Saddam Hussein invaded Kuwait the year before. Bush also launched a controversial invasion in Panama, dubbed ‘Operation Just Cause’, which ended in the ousting and arrest of the country’s ruler, Manuel Noriega. Despite victory overseas, Bush failed to secure a second term. In 1992, he lost to Democrat Bill Clinton. His “Read my lips: no new taxes” pledge, which he made during the previous presidential race, became a bitter symbol of broken campaign promises. His first moves toward elected office came in the early 1960s. He became chairman of the local Republican Party in the Houston area in 1962. Two years later, he failed in his effort to wrest a Senate seat away from Democrat Ralph Yarborough. He won election to the House in 1966 and served two terms. Another Senate bid, in 1970, again ended in failure. He was then appointed as U.S. ambassador to the United Nations by former President Nixon. The next few years brought more high-profile appointments. He was head of the Republican National Committee in 1973 and 1974, as the Watergate scandal reached its climax; he served as a quasi-ambassador to China at a time when the two nations did not have full diplomatic relations; and he became director of the CIA in the waning days of former President Ford’s administration. After his own bid faded, however, Bush was added by Reagan as his vice presidential running mate. In office, Bush served with an acute sense of loyalty, never publicly expressing differences of opinion with the 40th president. The link with Reagan would prove a mixed blessing for Bush. The prominence of his office enabled him to see off other challengers for the GOP presidential nomination in 1988. In the general election, he benefitted from Reagan’s strong approval ratings and a prosperous economy. But questions about the Iran-Contra scandal, which marred Reagan’s second term, continued to dog Bush. The central machinations involved the United States organizing clandestine arms sales to Iran in order to expedite the release of American hostages. Some of the profits were then funneled to the Contras, several Nicaraguan opposition groups tied to the former regime, who were fighting to overthrow the country’s leftist government. Bush later claimed that he had been kept “out of the loop” on the project. But skeptics believed his explanation strained credulity, given that he had attended numerous meetings at which it had been discussed. No legal wrongdoing on Bush’s part was ever proven, but the reverberations lasted long enough to do him damage. In the closing days of the 1992 campaign, Bush’s aides felt they were making up ground on Clinton. But in the final week, a prosecutor released a document that cast serious doubt on Bush’s earlier accounts of Iran-Contra. That was enough to put a stop to his momentum. Despite the wounds inflicted during that election campaign, Bush and Clinton went on to develop a close and respectful relationship. In the first decade of this century, they worked together on aid efforts following two natural disasters: the Asian tsunami of 2004 and Hurricane Katrina in 2005. By the time of Katrina, one of Bush’s sons, George W. Bush, was serving his second term as president. The Bushes were only the second father-and-son in history to have held the office, after John Adams and John Quincy Adams. In 2016, however, a presidential run by another son, Jeb Bush, went nowhere. Jeb Bush had previously served as governor of Florida from 1999 to 2007 but he proved a bad fit for a discontented electorate. It was a bitter campaign, and the patriarch told The Texas Tribune through a spokesman that he would neither “participate in or comment on the presidential campaign,” after it became apparent that Donald Trump would become the Republican nominee. However, Bush wrote to Trump, apologizing that he would not be able to attend the 45th president’s inauguration because of health concerns. The former president tried to stay active, despite his numerous health problems. He celebrated his 80th, 85th, and 90th anniversaries by skydiving. Last year, Bush also had his own #MeToo moment: an actress accused him of telling “a dirty joke” and groping her during a meeting. Bush admitted that some of his actions may have been viewed as “inappropriate” and apologized. George H.W. 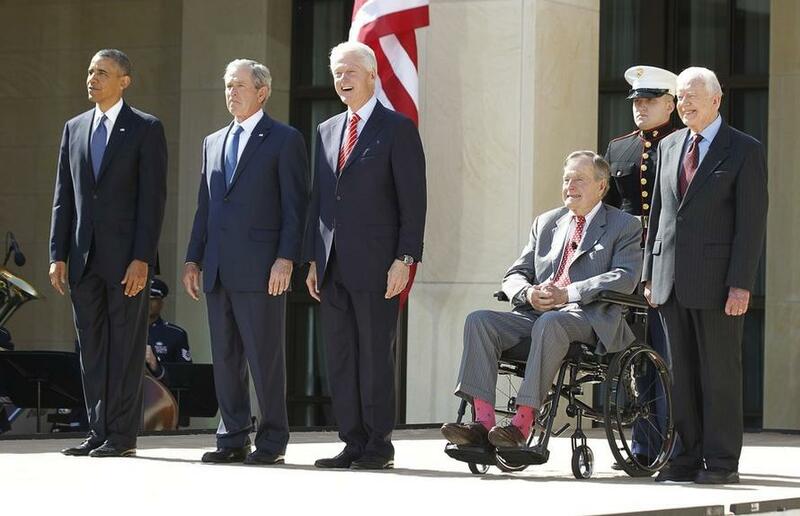 Bush is survived by five of his children: George W., Jeb, Dorothy, Neil and Marvin. A sixth child, Robin, died of leukemia in 1953 at the age of 3.